Who doesn’t love a good burger? While it may be difficult to imagine one without a bun, I’ve found that I’m way more creative with toppings when I can’t just ‘put a lid on it (aka bun).’ My burgers have no room for a bad hair day, but I love the challenge! 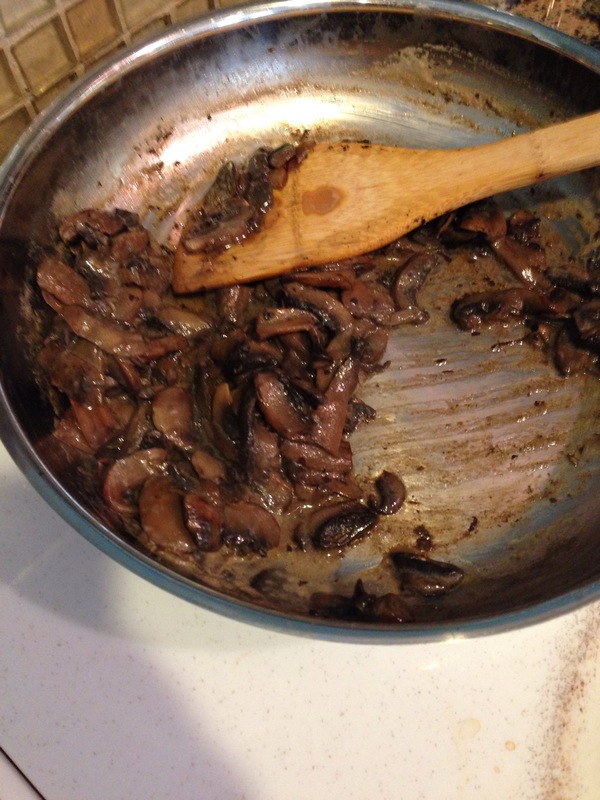 My latest accessory attempt was a mushroom sauce. Why, because the hubs found a recipe that sounded delicious from http://www.marksdailyapple.com and I wanted to test my abilities. Another beautiful side effect of eating real food was the need and love of developing some serious cooking skills. But alas, back to me slicing mushrooms and being thankful that we had a wee bit of beef bone broth from our mugful the night before (get that collagen in the tasty way, ladies)! 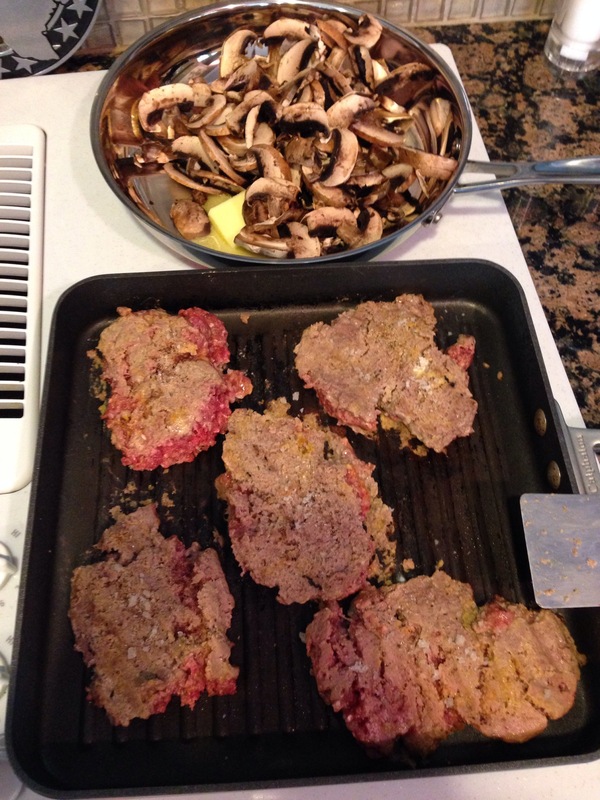 So, the burger twist tonight was that we used bison from the farmer’s market. Bison is super lean and dried out quickly, so I’ve found that adding an egg for additional fat really keeps it moist. 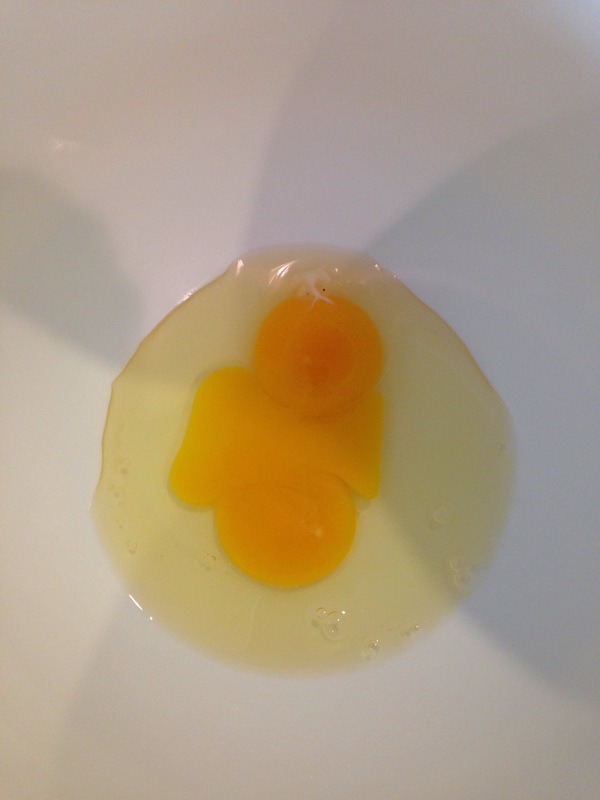 But in this day, woot woot, I cracked open my first double yolk! 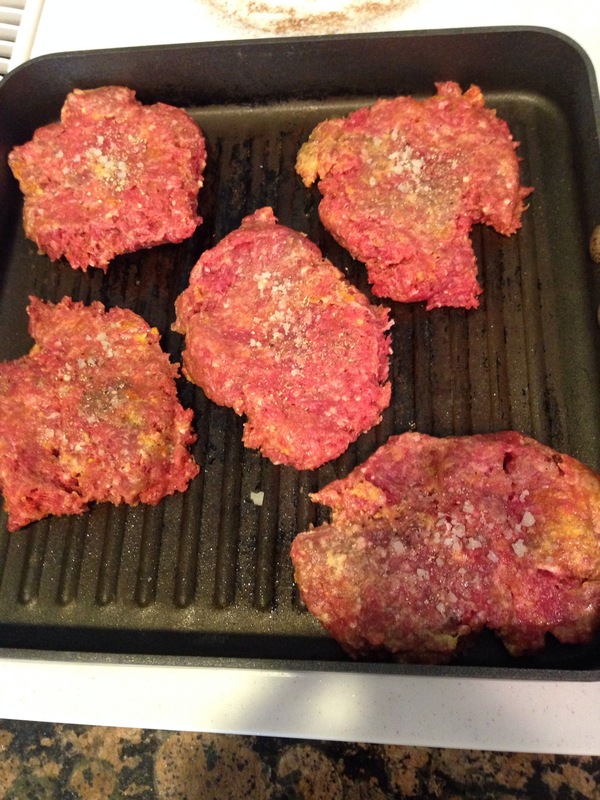 I then added in the meat, 1/4 c brown rice flour, 1 tbsp garlic powder, 1 tbsp onion powder and 1/2 tbsp turmeric. I’m not a fan of using my hands, so made my silicone spatula do the heavy lifting. I sear each side on the grill pan and then throw in a 350 degree oven for about 10 mins. 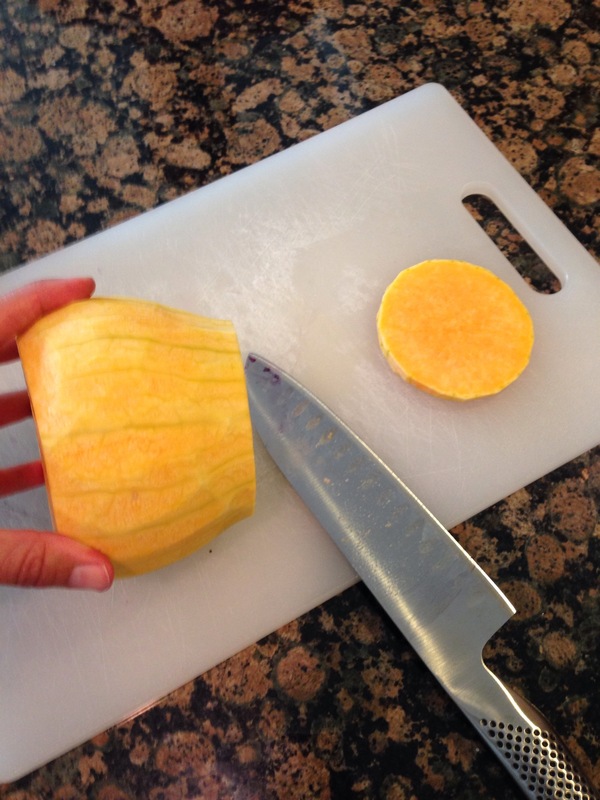 In the meantime, I have peeled and sliced a butternut squash and red onion. 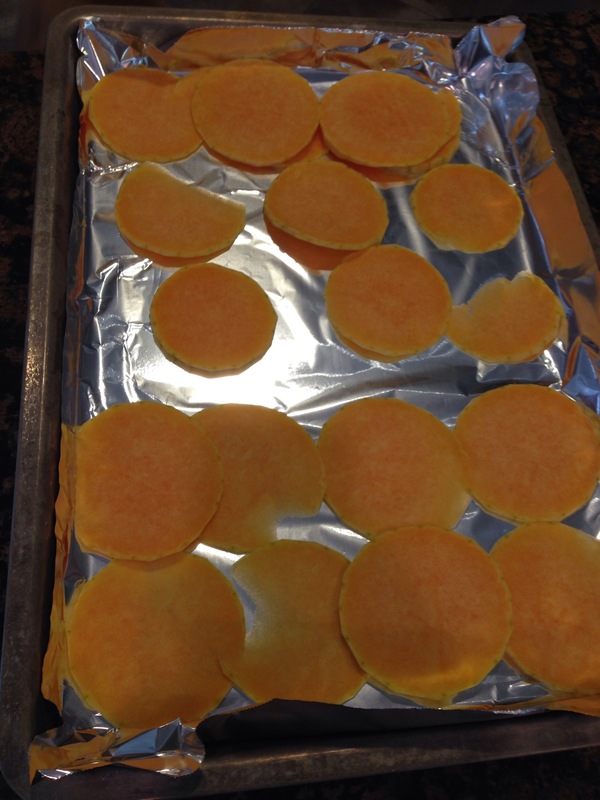 I place each on a separate foil-lined baking sheet. 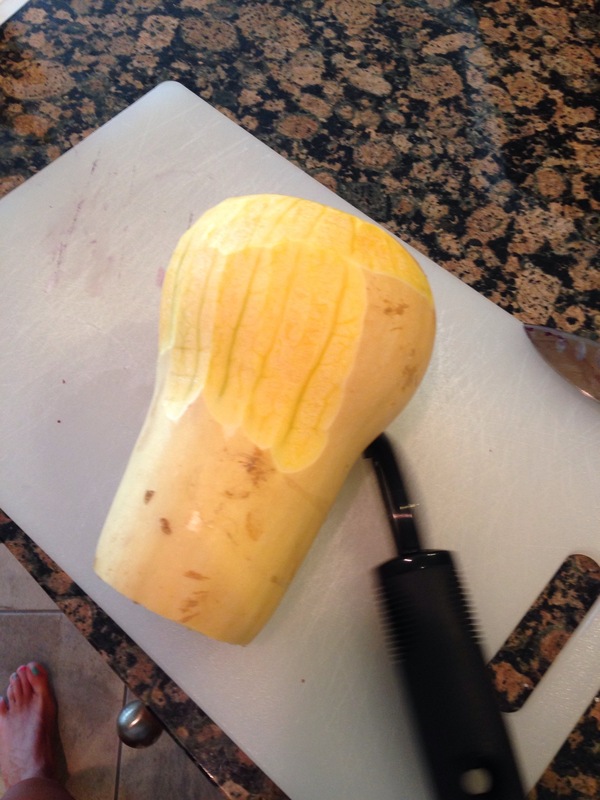 I drizzle the squash with coconut oil and the onion with olive oil. Salt and pepper are sprinkled on each. They all go in the hot box as well. Then, I turned my attention to the shrooms! A simple slice and thrown in a pan with 2 tbsp of grass-fed Kalona butter and we were in business! 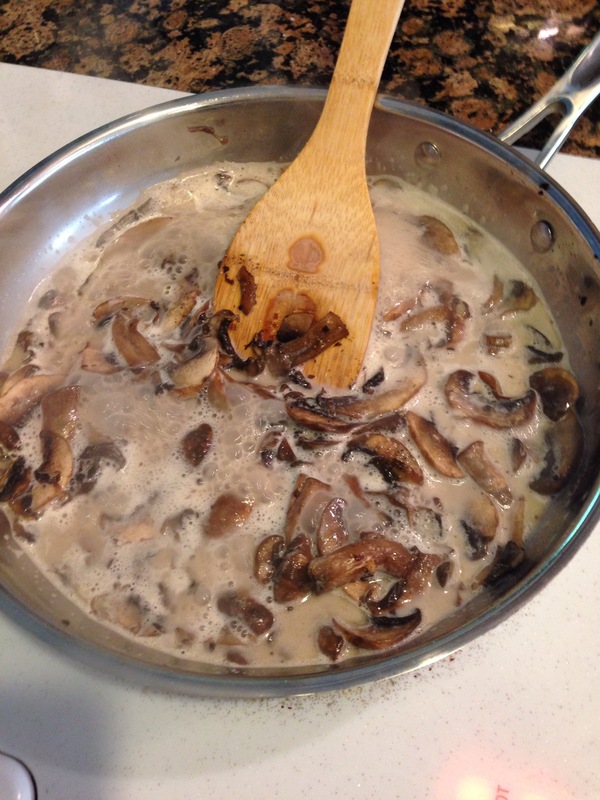 I let it sauté for several minutes before adding 1/4 c beef broth and 1/4 c heavy cream. I let it reduce (this was quick!) until syrupy. 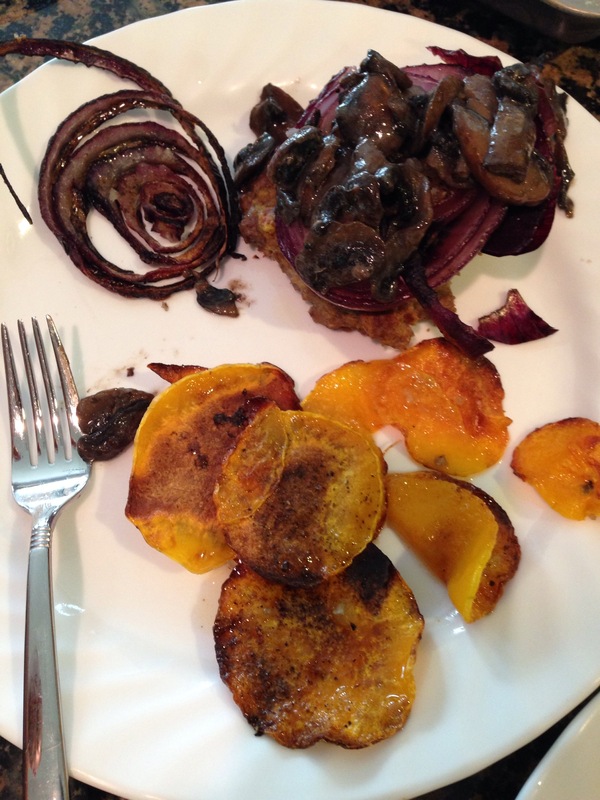 Then made my burgers by layering on the onion and then the mushroom sauce and adding the squash chips on the side. Heavenly! Today is the first day back in school. Many moms I chat with all dread the making of school lunches. I think we can all agree that what you pack is often (not always) more nutritious than what is offered in the cafeteria. We put in one protein. 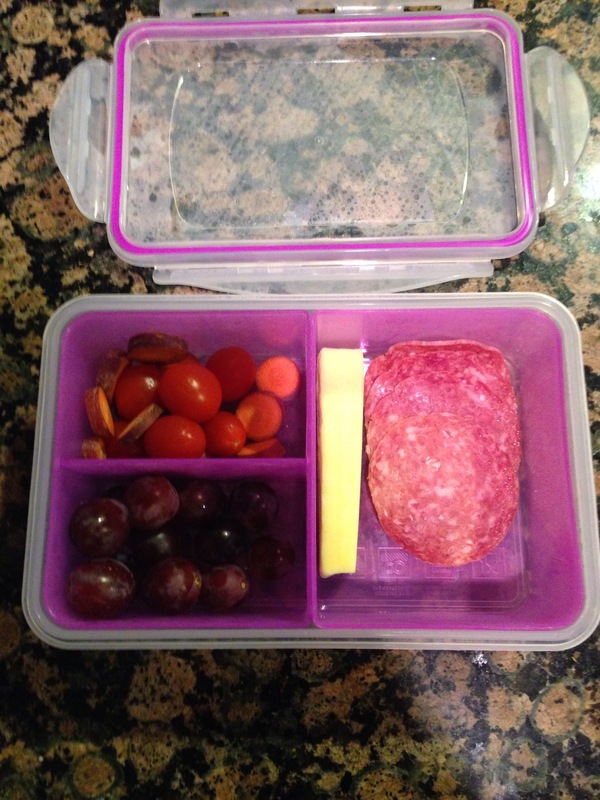 Our favorites are hard boiled eggs, Applegate organic salami or Applegate pepperoni . There’s always the possibility of leftovers too. Sometimes we’ll throw in homemade beef jerky or a Tanka bar. We then put in two sides (made easier by this handy lunch kit). I wrote on the menu what items were available in the kitchen this week to include. 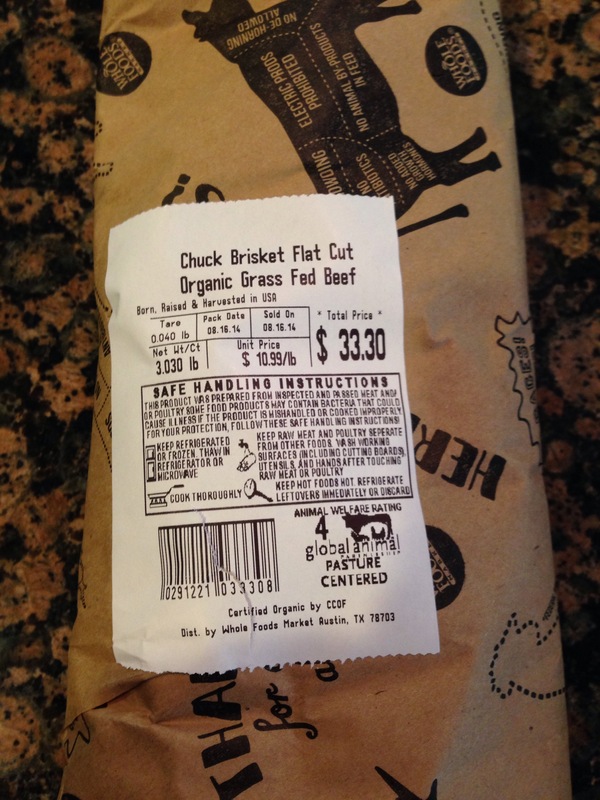 It is a desire for our family to eat locally, which also means seasonally. Therefore fruit these days means nectarines, plums, etc. in the fall, you’ll find lots of apples and applesauce. Each kid picked out their items, placed how much they needed (this has taken lots of practice and still requires supervision) and voila! The true test will be seeing if it is empty when they get home. My 2nd grader will have done her older sibling duty if she informs my Kindergartner the penalties of not finishing…he’s a work in progress. I should also mention how much easier it is if your fruits and veggies are prepped. As a meal planner, I make the most of my Sundays. Plucking grapes (my kids do this for me!) and cutting up carrots when you have time makes it easier to eat healthy when you do not. Good luck! 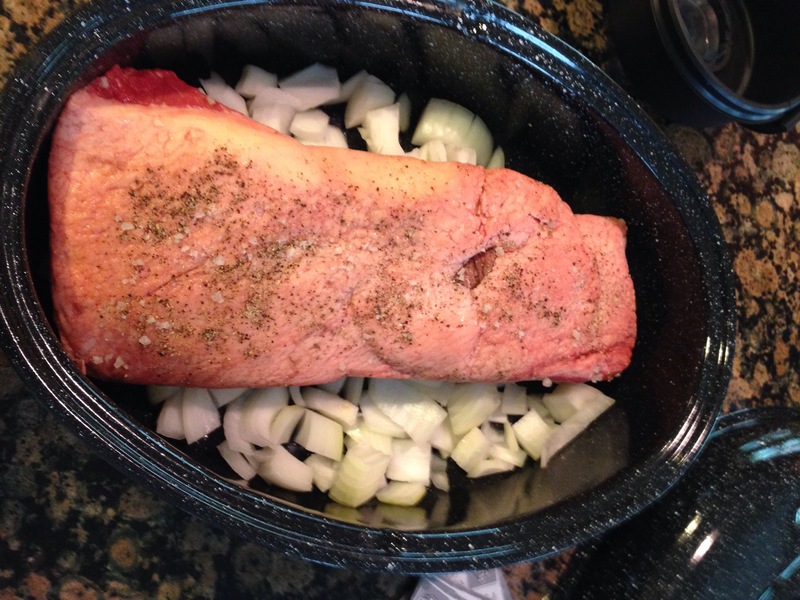 Sunday dinners traditionally revolve around a roast. While I don’t always follow tradition, I love the opportunity to embrace a braised dish that you get to smell all day long and enjoy the fruits of your labors at the end of a fun filled weekend. 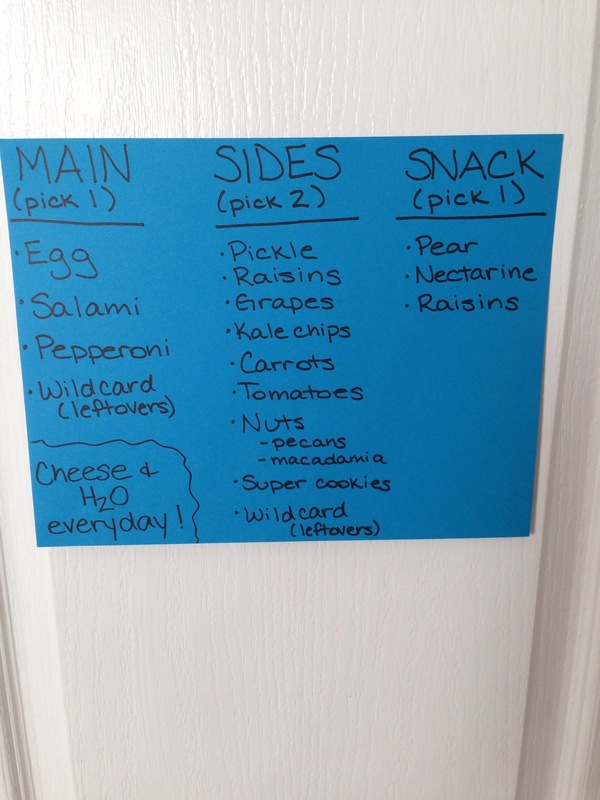 While perusing Pinterest for a change from what I already have pinned, I discovered a blog called Primal Palate that even has a free app of recipes and grocery list planning. There I saw the name Caramelized Beef Brisket. 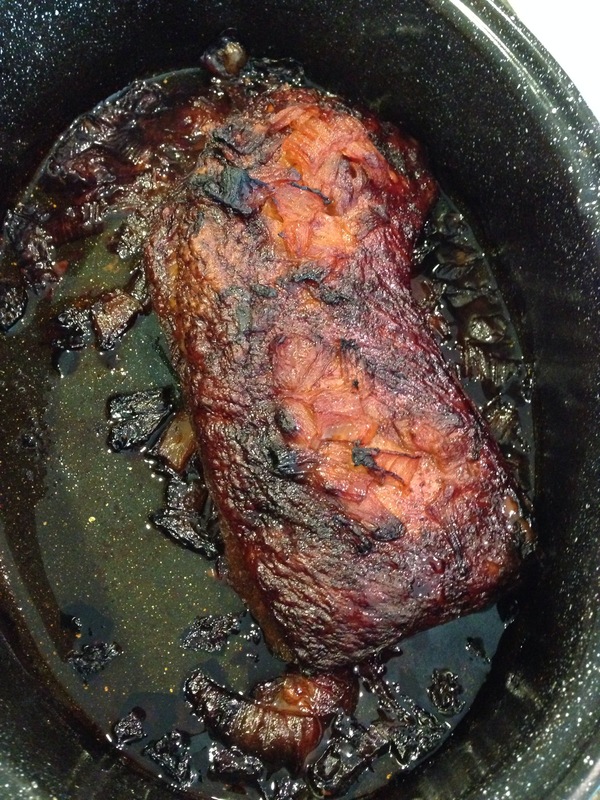 I love brisket and caramelization, but wasn’t sure that they could be successfully combined. Challenge on! The best part was that it had 3 ingredients!! 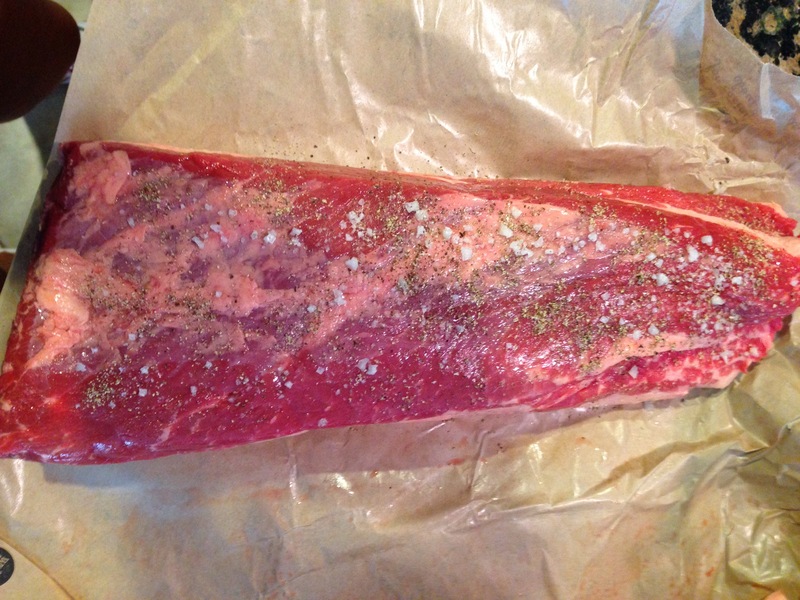 I picked up a beautiful grass-fed brisket from Whole Foods and seasoned both sides with salt and pepper. I then rough chopped a yellow onion for the bottom of my roasting dish (with oven set at 350) and set the meat on top. place fat side up in the pan so as the fat melts, it settled into the meat keeping it moist and flavorful. After roasting, lid off for 90 minutes, it already looked and smelled delectable. I then ladled in 2 cups of beef broth that we had ordered from uswell nessmeats.com and covered the roaster and lowered the oven temp to 325. Over the next 4 hours, I basted the meat with the jus and saw the caramelization happening before my eyes. 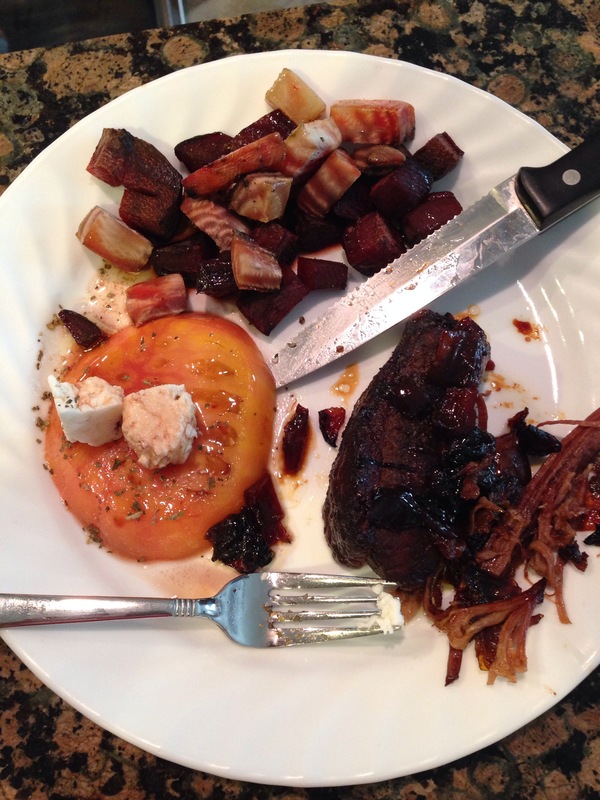 Realizing I needed some sides, I looked to the beets from my new CSA basket and an heirloom tomato. 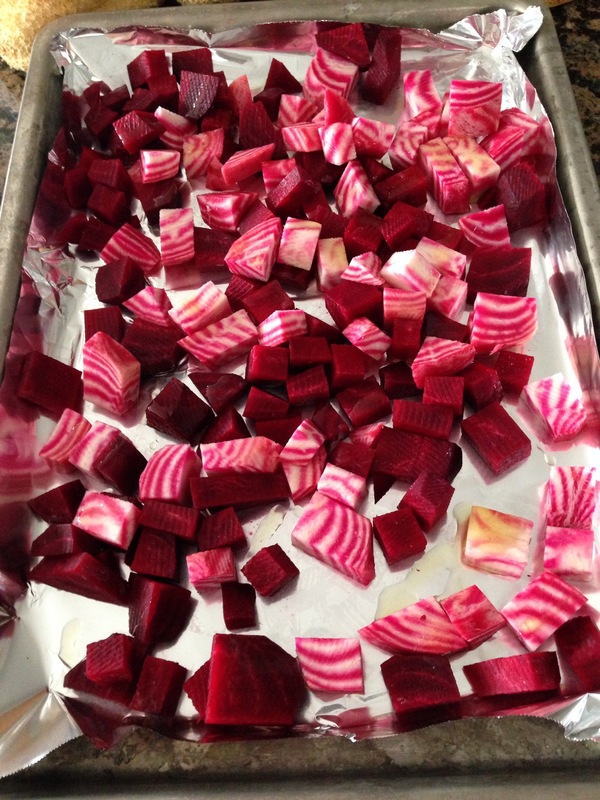 I peeled and chopped the beets, placed them on a foil lined baking sheet and tossed with olive oil, salt and pepper. They went in the oven with the brisket for last last hour or so. We love a good caprese salad, but lacked mozz, so substituted some local cow’s milk feta and drizzled olive oil, balsamic and basil on top. Voila! !